Paper backing 66,9 x 49,9 cm. Music, and art in general, is the triumph of order over chaos. The formless is neither music, nor is it art. 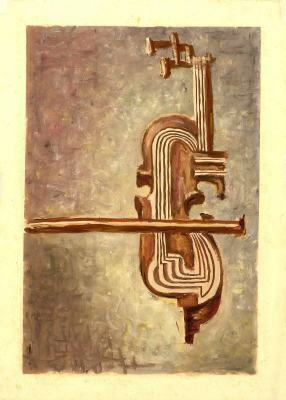 From levels inferior to this, however, where drawing and geometry are not perceived (as in the background here) the labour of forming and organizing which is painting can begin (for example, through colour); the musical instrument here and its bow, arranged perpendicularly, embody order in its maximum expression. Cf. The commentaries to the paintings The Work of the Artist (I), The Musician, Manual Labour.